Ever since the advent of computer use by established banking and insurance organizations in the early 1950s, financial services has been a sector that generates an enormous amount of customer transaction data. According to the latest worldwide market study by Juniper Research, the operational cost savings from using chatbots within banking will reach $7.3 billion globally by 2023 -- that's up from an estimated $209 million savings in 2019. This tremendous productivity improvement represents 862 million hours potentially saved for banking business operations by 2023 -- that's equivalent to nearly half a million working years. 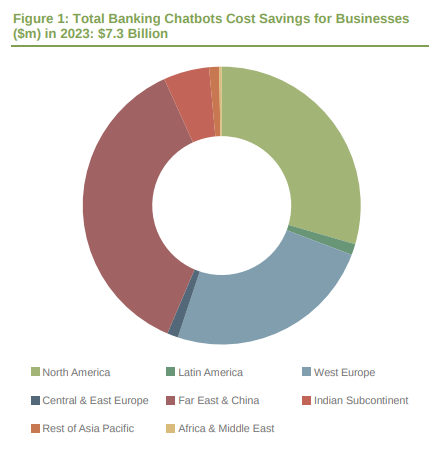 According to the new research, chatbots can now reduce excessive operational costs in financial services organizations, by resolving customer support requests in a fully automated way. As Natural Language Processing (NLP) capabilities evolve and domain expertise is added to AI systems, chatbots are demonstrating a proven record of end-to-end service delivery, which will drive adoption by even the most skeptical legacy financial institutions. This anticipated productivity advancement is reflected within the forecast growth of nearly 3,150 percent in successful banking chatbot interactions conducted between 2019 and 2023. According to the Juniper assessment, chatbot integration in mobile banking software apps will be the dominant channel for chatbot-driven customer communications, accounting for 79 percent of successful interactions during 2023. This dominance is due to several reasons, primarily an increase in user preference for app-based banking, as well as the strong performance of early banking chatbot deployments -- such as Bank of America’s 'Erica' chatbot. "Chatbots in banking allow heavily automated customer service, in a highly scalable way. This type of deployment can be crucial in digital transformation, allowing established banks to better compete with challenger banks," said Nick Maynard, senior analyst at Juniper Research. The market study also uncovered that AI, including chatbots, will have a highly disruptive impact on insurance claims management, leading to cost savings of almost $1.3 billion by 2023 -- applied across automobile, life, property and health insurance, that's up from $300 million savings in 2019. Chatbots can automate post-incident data collection, with AI used to analyze the details or images provided using computer vision. These methods will not only save money for insurers, but they will also reduce time to claim settlement, and potentially improve customer loyalty.